The fourth and final United set has come to digital, with the release of United: Missions. The game update features cards and missions associated with the expansion, and also some updates for everyone (for free). Introduced to the tabletop game two years ago, United: Missions shook up the game by giving you additional ways to play and to win. In the app, when you play a game with the Missions expansion, three of them are given to each player face-down. When you complete an objective on a Missions card, you gain that card’s reward. Complete all three missions, and you win the game. With Missions, a grand comeback is always possible! Having missions changes the way you should consider how to tackle the trade deck. Some of the missions make that obvious, like Colonize does. But some others, like Ally, really take a lot of work. If you get three missions that seem easy to complete, you might want to consider going for that even if it means making your deck weaker for the normal way to win. On the other hand, I don’t aim for the missions win condition when I have Ally or Diversify. If I can get there, great! You’ll discover the missions that suit your play style over time, and can draw your own conclusions. Mission cards are hidden inside the stars next to your player avatar. The ones lit up in green indicate completed missions. I’m down to 12 authority, but only need to complete one more mission to win the game! The first mission whose objective you complete will be the mission you complete… it happens automatically. You cannot choose to not complete a mission. Once you meet the requirements in the objective, you complete the mission and get the reward. In the extremely rare case of triggering two or three missions objectives at once, you choose which one you want to complete. Chapter Sixteen of the campaign is unlocked through purchasing the United: Missions set. As you might expect, it makes use of the missions cards. 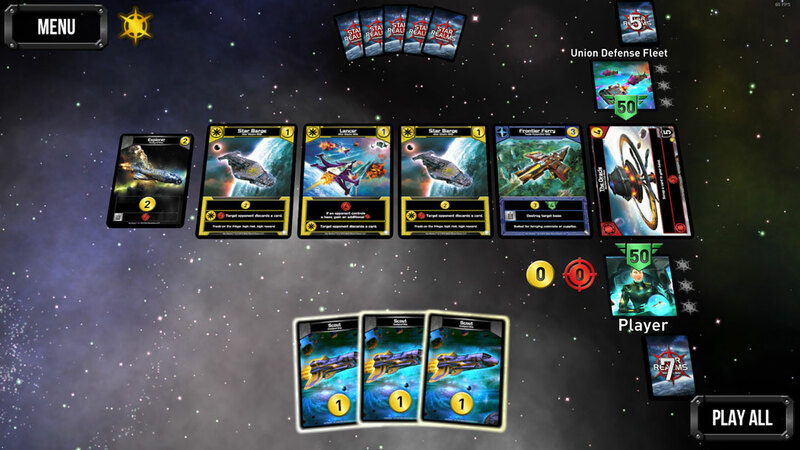 In many parts of the chapter, you can see your opponent’s mission cards. Just click the stars next to your opponent’s avatar to see them. 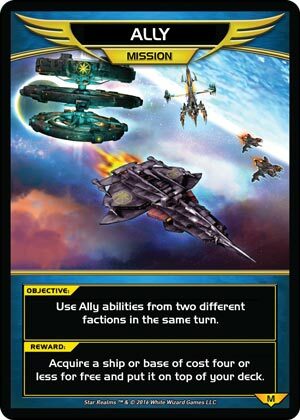 The story of Star Realms United comes to a close with this set. Will you be able to survive the Supernova? How will the Colony Wars end? Find out! 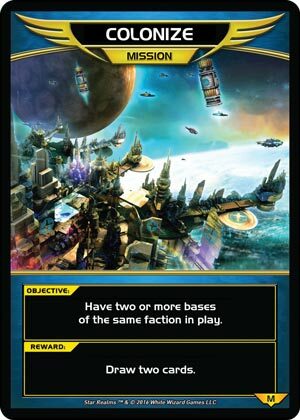 In the first mission of the new campaign chapter, Star Empire and Trade Federation cards cost 1 less to acquire, to a minimum of 1. Star Barge is not lowered, but both Lancer and Frontier Ferry are. You can tell because the cost number is in blue, and because Lancer only costs 1! And who doesn’t want to start the game with three Trade Federation cards, right? Also in the update, the damage effects have changed. When you deal a lot of damage to win the game, you’ll see a zoom in effect. And when you win the game via missions, you will get a fireworks display! Get the Expansion Now For Only $1.99. This expansion is available for just $1.99 on the App Store for iOS devices, Google Play for Android, and Steam for PC and Mac. As always, a purchase on one system will unlock the expansion on all of them for your account. We hope you enjoy the new set! Andrea Davis is an award-winning designer and producer. They have designed Star Realms promos, Hero Realms Boss Decks, and cards for Epic Card Game. Andrea is currently pursuing a Master’s Degree in Game Design and Development at the University of Limerick in Ireland.